She sank, in Krum Bay, South St Thomas, on 6th November 1984 during Tropical Storm Klaus, which was upgraded to a Hurricane only a few hours after. The WIT Shoal II was then patched in order to be re-floated. Many versions of what was going to happen to her abound. She was going to be sunk in very deep water south of the Virgin Islands or she was going to Puerto Rico to be scrapped. Either way, her hull was roughly patched to survive the trip and she was towed out of Charlotte Amalie during May 1985. One of the patches broke free a couple of miles into the trip, so the towline was cut. She sank gracefully bow first to sit upright and intact in 90 feet of water, on sand. There are five levels of deck to explore, from the pilothouse down to the bottom of the hold, with many routes in and out making it easy and safe. The dive sometimes has a strong current, so we dive the wreck at slack water. There is an abundance of life on this wreck, with Southern and Spotted Eagle Rays, resident Barracudas, Horse-eye Jacks and Turtles. 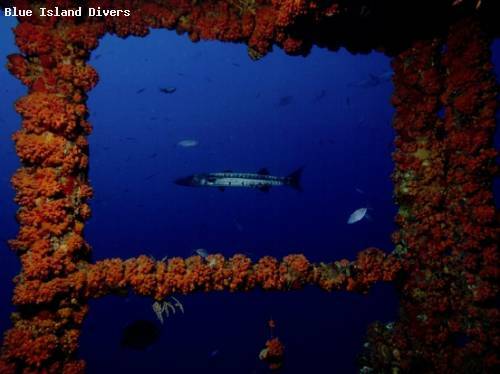 This is a perfect wreck on which to advance your diving education by completing the Advanced Open Water certification, or the Wreck Diving specialty which takes you on four wreck dives culminating in an awesome penetration through the inside of a sunken ship.